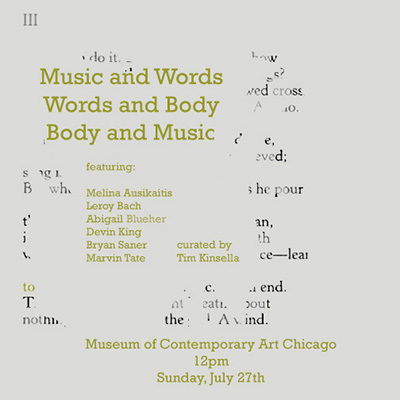 InterArts faculty member Bryan Saner will be performing in Music and Words / Words and Body / Body and Music in the Chicago Museum of Contemporary Art theater on Sunday July 27 at 12:00 p.m. noon as part of the museum’s Word Weekend. Featuring: Melina Ausikaitis, Leroy Bach, Abigail Blueher, Devin King, Bryan Saner, and Marvin Tate. Directed by Tim Kinsella. Approximately 60 minutes. The event is also free with museum admission.